When you’re dining away from home, we make healthy choices easier. 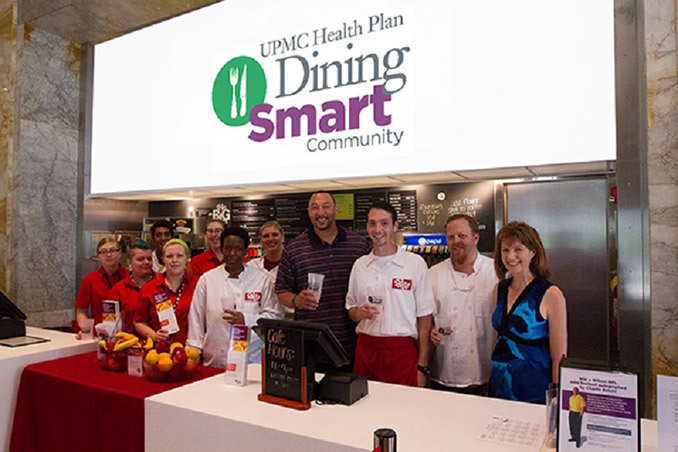 Dining Smart Community is a part of UPMC Health Plan’s Dining Smart program. UPMC Health Plan doctors and dietitians developed this proven worksite nutrition plan, and UPMC facilities follow it to support a culture of healthy eating in the workplace. Now, we are pleased to help several community organizations to do the same for their staff and the people they serve. Support healthy dining, catering, and vending options. 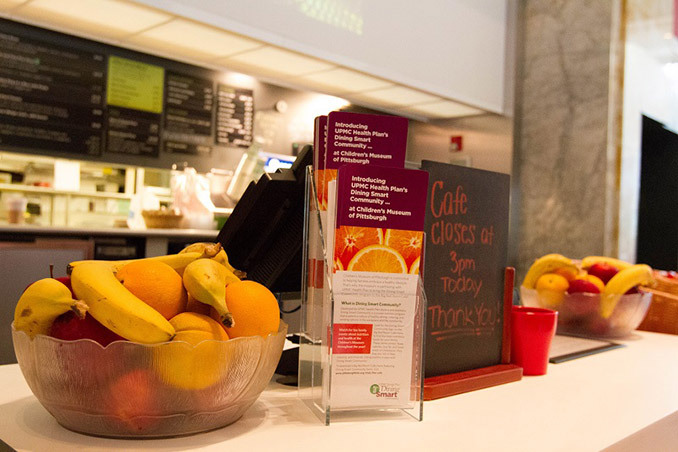 Offer menu items that meet UPMC Dining Smart guidelines. Set goals and objectives for healthy dining to enhance wellness in the community. Offer food, beverages, and snacks that are easy to identify. Educate the community with practical tips for healthy dining anywhere. In places where Dining Smart Community is available, look for our signature green logo as your guide to the healthiest foods. These items contain fewer calories and less fat, sodium, and cholesterol. They are also rich in fiber, vitamins, and minerals. The Children’s Museum of Pittsburgh was the first organization to take part in Dining Smart Community. 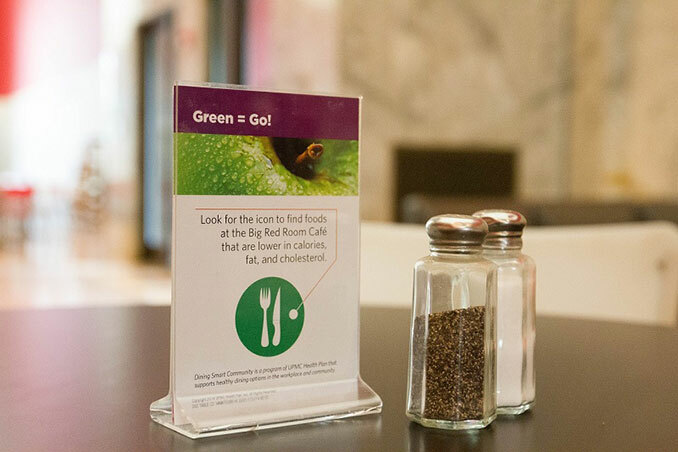 The museum’s Big Red Room Café offers a variety of healthy menu items, such as fresh salads made with locally sourced produce, homemade vegetarian wraps, fresh fruit cups, and low-fat yogurt parfaits. When families visit the Heinz History Center’s Kidsburgh exhibit, they can take home healthy recipe cards, which highlight the nutrients found in dairy products. Get your milk mustache on and check it out! Fill up on fruits and vegetables – Make at least half of your plate fruits and vegetables, fresh if possible, with little or no added fat, sugar, or salt. Getting a variety of colors (green, orange, and red) is an easy way to make sure you’re getting different nutrients. If you can only afford the canned variety, drain and rinse before using. Go lean with protein – One quarter of your plate should include low-fat beef, skinless poultry, fish, beans, or tofu. Eating seafood as your protein source twice a week can help increase your intake of heart-healthy fats like omega-3. One quarter of your plate should contain a grain or another carbohydrate-rich food – Choosing a whole-grain option (something with “whole grain” as the first item on the list of ingredients) will provide you with more fiber and help you feel more satisfied than a refined grain product. Bored with brown rice? Try a new grain like quinoa, farro, or barley, or legumes like black beans and chickpeas. To meet your daily calcium needs, choose low-fat dairy products or fortified soy or almond milk alternatives – Nondairy sources of calcium include spinach, collard greens, and almonds. When it comes to lunchtime, do you feel like your family is in a peanut-butter-and-jelly rut? Here’s how to instill some variety in your midday meal while also keeping it nutritious. Look for 100 percent whole grain options when choosing bread. Tired of whole wheat? Try 100 percent oat bread, or multigrain sprouted breads (found in the freezer section). Instead of bread, wrap fillings in a tortilla, stuff a pita pocket, or even make lettuce “boats” out of large romaine leaves. Instead of adding high-fat mayonnaise or butter, try a different spread like avocado, hummus, or spicy mustard. Hate to give up mayo? Try a low-fat version or just use less. For school lunches, at the beginning of the week, wash and chop a variety of veggies and place them in individual containers for easy transport. Include crispy favorites like baby carrots, cucumber slices, and cherry tomatoes. If you don’t like plain veggies, include dip options like reduced-fat ranch, yogurt, or hummus. If you choose canned fruits, make sure they are canned in their own juices (no added sugar). Keep pre-sliced apples and pears looking fresh with a dash of lemon juice to reduce browning. Add frozen fruit to cottage cheese or yogurt for a protein-packed snack that will defrost by lunch time. Revitalize your peanut butter and jelly sandwich by trying almond butter, cashew butter, or sunflower seed butter instead of peanut butter. Buy 100 percent fruit spreads to avoid extra sugar. If you need to satisfy a sweet tooth, do so wisely by packing an individual piece of dark chocolate or a small handful of dried fruit to control portion size. Remember to keep food cool. Make sure you have access to refrigeration for any lunches that contain dairy or meat products.